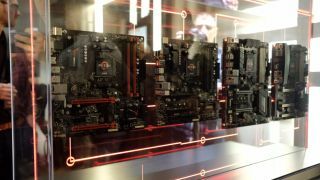 Yesterday witnessed the official reveal of AMD’s exciting new Ryzen processors – which finally make octo-core CPUs affordable to a mainstream audience – and already the flagship model has broken a world record for performance in Cinebench. Mind you, some ridiculous cooling was needed in the quest to push the Ryzen 7 1800X processor up to 5.2GHz on all eight of its cores, with the voltage cranked to 1.875v, and liquid nitrogen being used to achieve a temperature of around -200 degrees Celsius. As Wccftech reports, this allowed the gleeful overclockers in question to hit a score of 2,449 in Cinebench R15’s multi-threaded tests, beating the previous all-time record, although admittedly not by that much (39 points). Obviously this isn’t a realistic overclocking scenario in terms of the use of liquid nitrogen cooling, but the record falling bodes well for the sort of boost Ryzen owners can expect when it comes to actual real-world performance. What will be really interesting is to see how far the 1800X can be pushed using air cooling. The 8-core chip has a base clock of 3.6GHz with a boost to 4GHz, so we can realistically hope for around 4.4GHz with air cooling, depending on the exact cooling solution and, of course, the CPU lottery (there are always slight variances when it comes to overclocking tolerances with processors, and you just have to hope you get lucky). At any rate, 4.4GHz will be plenty enough for some storming performance levels. Remember that the 1800X will be going on sale for $499 (about £400, AU$650), which is less than half the price of Intel’s Core i7-6900K. AMD has already claimed that its flagship processor beats the latter in Cinebench R15 multi-threaded, and by a considerable margin: 1,601 to 1,474. Hence all the excitement regarding AMD’s new chips – it certainly looks like the processor world is about to become a far more competitive environment, which is great news for the average consumer. Which are the best processors you can buy right now, though?